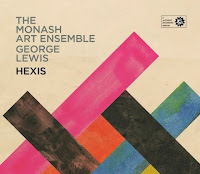 In 2013 the musician, composer and professor George Lewis collaborated with the Monash Art Ensemble at the Sir Zelman Cowen School of Music of Monash University. The album Hexis was the result, released by Jazzhead in 2014. Comprised of only four tracks, Hexis is an outstanding album, a mixture of jazz and classical, composed and improvised. The sixteen piece ensemble, led by pianist Paul Grabowsky, sounds larger than their numbers suggest; the music feels massive and powerful. Lewis himself joins the group, working on electronics but also returning to his original primary instrument, the trombone. The album is littered with staccato rhythms and circular phrases; the tracks "Fractals" and "Triangle" at the beginning and the end of the album feature these ideas. "Fractals" starts with a tense, swirling wave of notes from the horns, that rises and falls like a choppy tide. "Triangle" is the repetitive striking of a triangle that is imaginatively echoed and improvised upon by the ensemble, a rollicking exploration of rhythm and sound created by a deceptively simple and timid percussive instrument. The highlight track is "Angry Bird," a fifteen minute heavyweight work that, frankly, I thought referenced Charlie Parker and the popular smart phone app, but apparently is a tribute to clarinetist David Rothenberg, who authored the book Why Birds Sing (later made into a BBC documentary). It does have furious moments of saxophone interplay, but also amusing electronic bird calls, like cartoon vultures. But it also demonstrates skillful improvisation within a framed structure, moments that are allowed to develop, then pull back, cleanly and with great attention to detail. And that is what is most striking throughout, a high level of intellect that does not feel heavy handed. Compositions that are well structured, but allows for spontaneity. And it is fun to listen. Also of note is that the Ensemble is comprised of mostly students, but one would never guess, given the level of execution. Hexis is a masterful album, and gets my highest recommendation.